Is there a lottery for immigration to Germany? A lottery ticket for immigration to Germany just a click away – sounds too good to be true? It is. There is no such thing as a lottery for coming to Germany. Be careful of fake websites and rumours on social media. Yet again, there is another dubious website with a fake offer for immigration to Germany making the rounds. 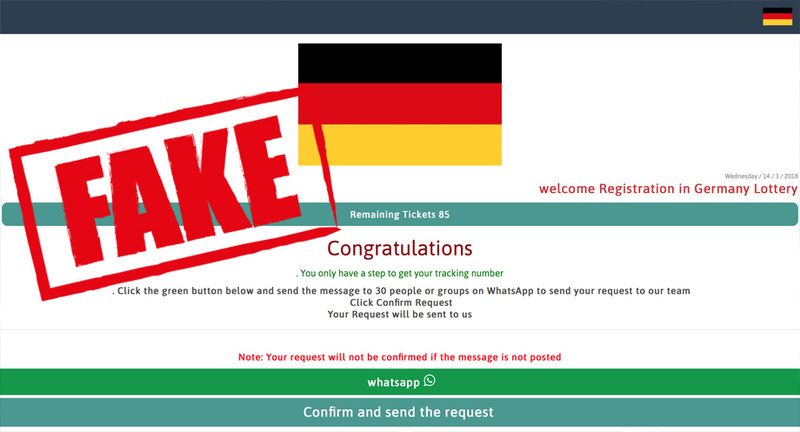 It asks you to send a message to 30 friends on Whatsapp before you can register for a lottery ticket to come to Germany. Obviously, offers on websites like these are fake – there is no lottery for immigration to Germany. The people behind websites such as these are trying to fool you. The comments on the website might look real but are just there to convince you that the offer is legitimate. But you know better: just because a website shows the German flag does not mean it’s official. And anyway, the German government would not ask you to spam your friends. Do not fall for the smugglers’ lies! Migration is a life decision – do not take it easily without getting the facts first. Will people smugglers protect you on your journey? Be aware that smugglers belong to organised criminal networks. All they really care about is earning money. Many won't care if you get hurt or die on the journey. If you plan on coming to Europe and Germany illegally, you're putting your life at risk. Husband or wife in Germany = right to join them? Anyone wanting to join their spouse in Germany must first meet certain requirements. How to make your new start work.